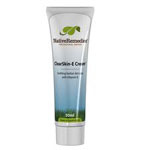 Native Remedies, the company that manufactures ClearSkin-E states on their site that they use a special kind of extraction method for their herbal products that while being less scientific, actually helps to ensure that their products are free from toxins and outside contaminants. This is why I bought this lotion, and because it said that it would be great at treating eczema. This was a great lotion and I felt soothed just putting it on. However, I saw a problem when using it, which was that I had to apply it too many times daily. Having to constantly coat my skin in this stuff makes me feel like a truly diseased person and it really takes time out of a busy day to go find a bathroom to put this tuff all over my skin. I have deep skin problems and basically need to coat my body in it and don’t have time to go around doing this to myself every day. I much prefer products that I only have to use once a day in the morning. So while this was great at relieving symptoms, I just had to use it way too many times daily and it ended up being a nuisance.